Benjamin Von Seeger, an Axiom Business Book Award winner author and telecommunications industry veteran, defies the conventional logic of global business how-to guides with this fresh, enlightening, and provocative perspective on todays global business landscape. He delivers hard-hitting and penetrating insights gleaned from a lifetime of overcoming obstacles to earn entrepreneurial successbeating and wooing corporate giants along the way. Von Seeger draws on his personal experiences educating business veterans, entrepreneurs and students alike as he delves down deep into the essential elements of global business success so that you, too, can apply proven principles to your professional life. Youll learn how to develop and leverage innate global business qualities and tactics that could mean the difference between commercial success and failure, including emotional and relational intelligence, relationship building, brand development, business strategy, and more. 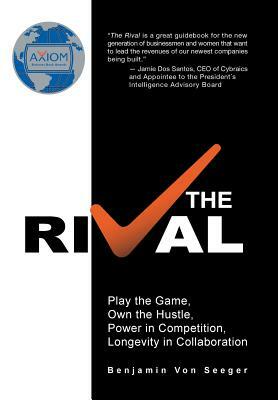 Whether youre launching a business or seeking to breathe new life into an existing venture, youll get all the bricks you need to lay a solid foundation for success with the business strategies in The Rival. Mr. Benjamin Von Seeger is a senior sales executive known for delivering and sustaining revenue and profit gain within a competitive global telecommunications market. He built world-class sales teams and implemented proven sales processes to exponentially increase revenue for multiple wholesale telecommunications providers.Throughout his seventeen-year career, Benjamin Von Seeger has held key sales positions with wholesale telecommunication and colocation service providers such as CENX, FiberNet Telecom Group, Terremark WorldwideNAP of the Americas, MCI, and Mannesmann Telecommunications in Germany.Prior to joining DELUXEHostopia, Benjamin Von Seeger was director of global markets with CENX, the first carried of Ethernet exchange. FiberNet/Zayo Bandwidth provides comprehensive broadband interconnectivity for the exchange of traffic, for and between multiple IP-centric and TDM-based networks. With FiberNet/Zayo Bandwidth, Benjamin Von Seeger was responsible for the development and management of millions of dollars in revenue from several international carrier accounts, such as Brazil Telecom, T Systems, France Telecom, Telefonica, and Telecom Italia.With Terremark WorldwideNAP of the Americas, Benjamin Von Seeger served as a vice president, where he secured millions of dollars in contracts from the largest national and international telecommunication carriers, content providers, and other major corporations from Latin America, Europe, Asia, and the United States.Terremark Worldwide, Inc. (AMEX: TMRK) was a leading operator of integrated Tier-1Network Access Points(NAPs) and a best-in-class network services, creating technology marketplaces in strategic global locations. Terremark, a colocation and cloud-hosting provider, was sold to Verizon for $1.4 billion; Verizon paid $19 in cash for each Terremark shareabout a 35 percent premium to the stocks closing price of $14.05 a share.Benjamin Von Seeger is multilingual, with proficiency in five languages: English, Italian, Romanian, German, and Spanish. He holds a degree in business administration and international relations from Ludwig Maximilian University Munich, in Germany, and has been awarded many professional degrees and certificates. He is currently attending the Advance Management Program for business administration and management at Harvard Business School.Ben has also served as a visiting colecturer at Keller Graduate School of Management/Devry University, enhancing the critical thinking and learning processes of undergraduate- and graduate-level students. He also served as a distinguished panelist for the graduate-level capstone projects during end-of-term evaluations. Ben continues to support the academic endeavors of students for different universities in the United States and around the world.